Its a new year, last week I reviewed last year’s efforts with my post: 2018, how’d my predictions fare?. Now its time for my 2019 edition and the main difference – 19 predictions is just getting too many… so this year I’ve trimmed it to a dozen. This year I’m including a star rating on my degree of confidence. 5 stars is I’m practically certain. 1 star is a distant long-shot, I’m not overly confident on, but I’m having a crack! I referenced this in my recent guest blog for Xero, but 2019 has all the signs of a big one for consolidation and acquisition activity across the industry. Firstly, Xero has a war-chest from a recent Singaporean debt raise of US$300m. They have openly earmarked this for acquisitions. Intuit have a new CEO in Sasan Goodarzi, who will be looking to make his mark and retains the biggest balance sheet in the segment. Sasan is on record as saying speed in innovation and delivery is a critical success factor under his reign. Acquisition for purposes of speed-to-market, innovative technologies and aqua-hire of talent are most certainly on Godarzi’s radar as I discussed with him at QBConnect 2018. I’m making a big call here, but the recent embedding of Fathom inside the new QuickBooks Online Advanced package, feels a lot like the engagement before the wedding. It also is a familiar play with the TSheets acquisition. Let’s hope for David, Daniel and Geoff that they are the next big acquisition by Intuit AND they get anywhere near the multiple Matt Rissell achieved with TSheets! Go Aussies! If Intuit does buy Fathom, I see Xero buying one of its competitors. Leaders include Kiwi origin Spotlight and UK Futrli. I’m leaning toward Spotlight as Xero previously acquired Richard Francis’s Spotlight Workpapers. Richard obviously has the track record… Still, this one is a long-shot! 2018 saw Rod Drury depart Xero and Brad Smith announce his succession at the helm of Intuit. It is incredible that Tim Reed the CEO at MYOB, has already survived more than a decade, a delisting, two eras under Private Equity ownership and a relisting. Tim is obviously a fabulous leader and a diligent numbers man. But can he / would he want to endure a second de-listing AND 3rd life under PE control? Whatever his political aspirations, I’m calling 2019 and KKR’s acquisition a likely time for Tim to announce his succession as MYOB CEO and his appointment to a board or two (and a committee or two). Smells a lot like a business for sale, diverging its branding from current parent company. My guess, the business is for sale, at a lot lower price point than the $180m MYOB had agreed to pay (before backing out). Having seen TSheets, the amazing marketing engine with an OK product, sell for a ridiculous multiple, I’m curious as to how a solid product with limited marketing, but strong distribution fares. Intuit seemed the logical acquirer of KeyPay, given KeyPay is the aussie payroll product embedded in QBo. But Intuit are apparently running with a UK acquisition Acrede to build out their international payroll (and ultimately replace KeyPay in Australia). This leans me towards Sage, whom I believe KeyPay already have a white-label relationship with as well. KeyPay would fill an obviously hole for Sage, though the lack of Salesforce underpinning does work against it. Still, its a long shot, but I reckon it could happen. Scheduled to arrive in the second half of calendar year 2019, Intaact has a massive reputation in the US, where it more than capably competes with NetSuite, Microsoft Dynamics 365, and Acumatica (what we know as MYOB Advanced) in the mid-market. I think Sage will do well with Intacct, particularly after a recent discussion I had with Sage AsiaPac head Kerry Agiasotis, in which he described not bringing a product to Australia and trying to Sage-ise it, the strategy is to bring Intaact and the company strategy and culture that has worked so well in the US, to Australia. Given the issues in market that MYOB are having with Advanced and the time it will take Wiise and other Microsoft Dynamics 365 Business Central partners to find their feet, I think Sage will do well with Intaact in the aussie mid to enterprise market. “Rhipe, which also distributes cloud software for VMWare, Citrix, Veaam, Acronis, Trend Micro, Symantec” is not a genuine channel for ERP. I feel KPMG are naive in their understanding of ERP channel AND the needs of mid-market customers. Cookie cutter doesn’t cut it. Someone who knows how to implement anti-virus software and MS Office, generally has little experience in implementing and supporting ERP. Ask MYOB, they tried fixed fee, out of the box installs when they acquired Exonet. That experiment didn’t end well. I’ve been around mid-market software for 20 years, and have seen many similar attempts, a total of zero have ever worked. Don’t get me wrong, I do think Microsoft Dynamics 365 Business Central(formerly known as NAV, formerly known as Navision) and its (KPMG owned) Wiise packaging (formerly known as Financials for Office 365) will do well. Just when they get the go to market and channel model right. Neither Microsoft nor KPMG are anywhere near getting it right yet in Australia yet (IMO). 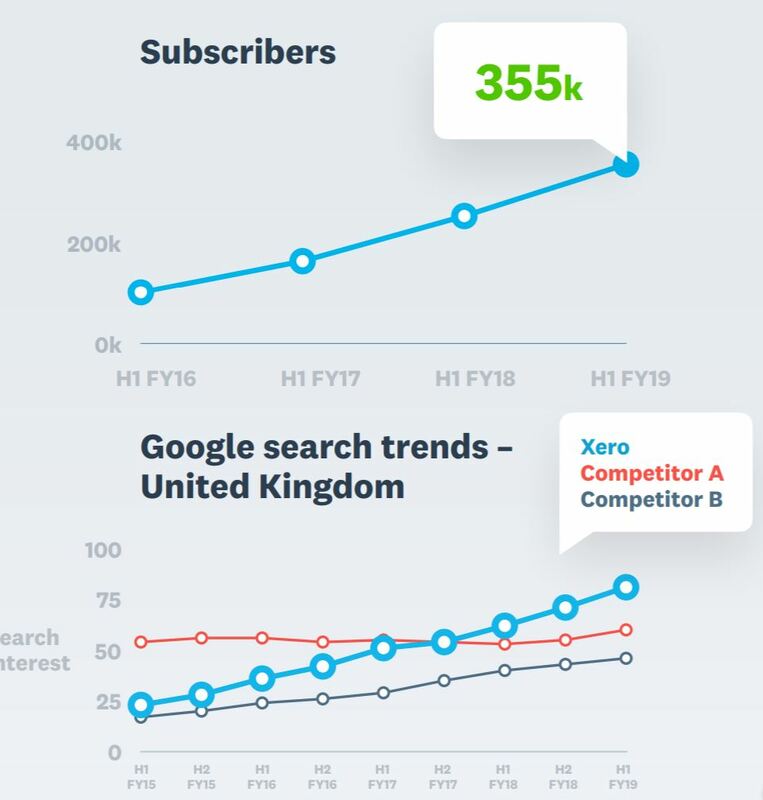 Xero claim the market leadership position currently in the UK with 355,000 subscriptions at the end of September 2018 (1H19 reporting), with Intuit reporting 305,000 at the end of July 2018 (FY18 reporting). The gap between the two is narrowing. I expect by the time Xero report 1H20 numbers and Intuit 1Q20, we will see Intuit claiming a higher aggregate number across QBo and QBSE than Xero across standard subs and ledgers. We can assume Competitor A is Sage and B is Intuit. JCurve the ASX listed, NetSuite partner, seemed an odd fit as an MYOB Advanced partner, given that JCurve [the product offering] as a packaged, low-priced licence and implementation of NetSuite, is probably the biggest, direct competitor to Advanced in the lower-mid-market. I’ve been watching from afar to see how JCurve and its relationship with NetSuite evolved, particularly after NetSuite launched SuiteSuccess worldwide to all partners, which in effect is a packaged offering of NetSuite (of similar ilk to the JCurve exclusive licence). Based on market feedback and ASX reporting, it seems JCurve’s relationship with NetSuite has strengthened, with JCurve making a strategic Asian acquisition and rocketing up the Platinum Partner list (with claims of #1 Platinum worldwide). Net Profit Before Tax Financial result impacted by project losses incurred from MYOB Advanced projects. Still no official announcement has been made. I await their JCurve’s 1H19 announcement to hear the news. 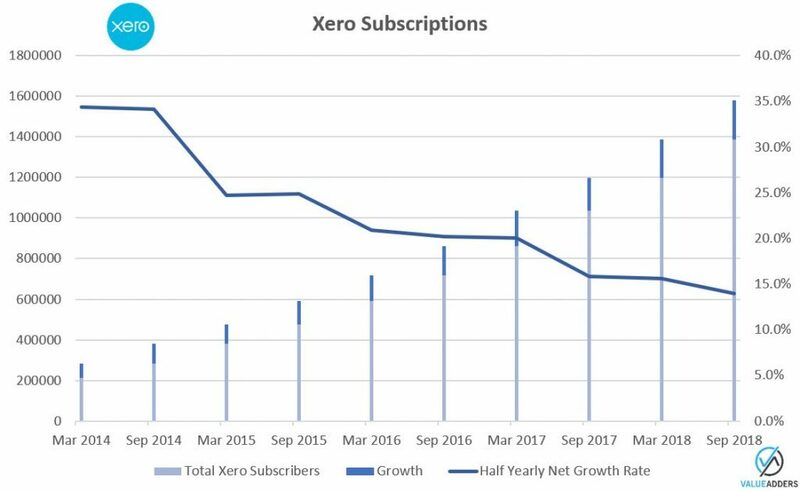 Xero has continued to increase its 6 monthly subscription adds, hitting 193,000 in 1H19 (up from 164,000 in 1H18 and 187,000 2H18), whilst as a percentage growth has slowed (13.9%, which was down from 15.8% in 1H18 and 15.6% 2H18). They would need to add 421,000 subs October 1 2018 – December 31 2019 to hit 2m subs this calendar year. I think they will. 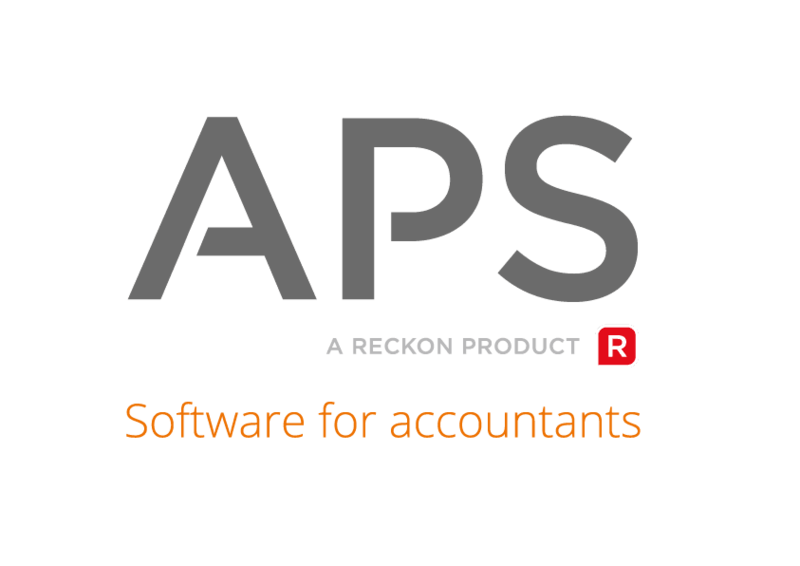 With Making Tax Digital in the UK and the end of life for MYOB AccountRight Desktop, they really should. It will be under-performance if they don’t. Last financial year, Intuit added an incredible 1m online subscriptions across its QBo and QBSE platforms, finishing July 2018 with 3.4m subscribers. 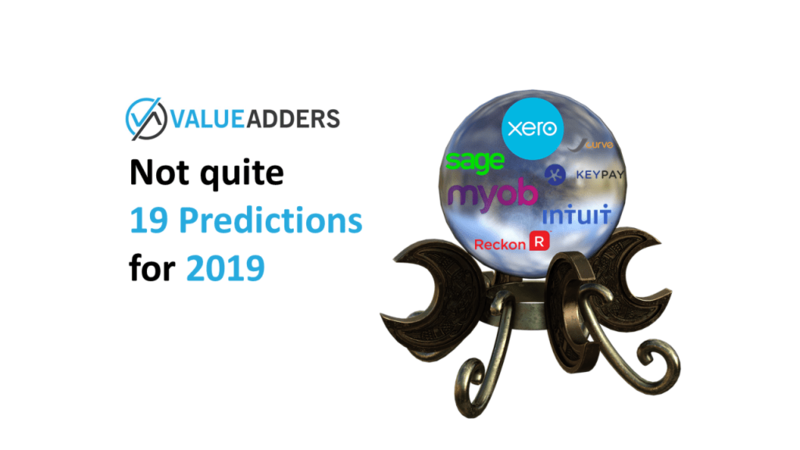 No doubt there were a lot of package deals with TurboTax and discounted partner deals among those numbers, but its a big number and a big lead in worldwide SME Cloud Accounting tech. 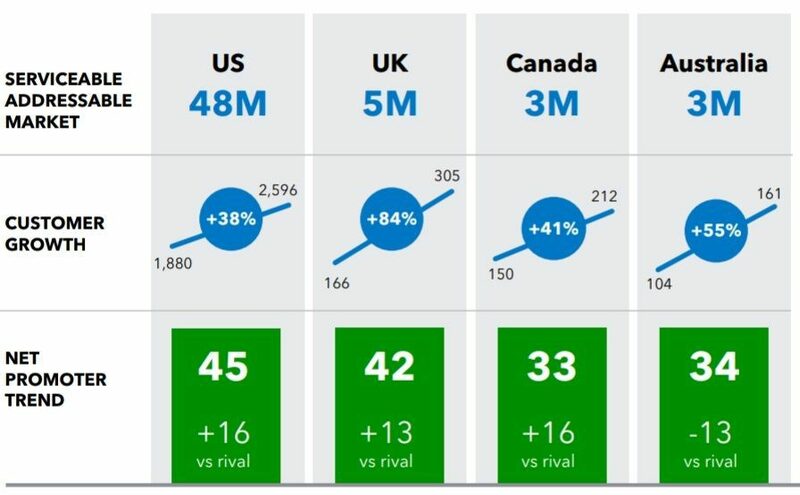 Whilst 2019 may bring more focus on revenue and ARPU, I still think with MTD in the UK and continued cloud adoption in the US, they should be able to repeat their efforts of last year. Whilst I did grow up in the country and I may have practiced this once or twice in my naive youth, at the end of the day I may be completely wrong! Let’s see. I’d love to hear your thoughts and predictions!